Sliding doors and wood screens open the modules to generous decks. Siding is coated corrugated steel. It could have been the premiere of a summer blockbuster. The line to tour the Glidehouse, the modern, prefabricated home that debuted in 2004 at Sunset’s Celebration Weekend event at our headquarters in Menlo Park, California, snaked out of sight. People waited for as long as an hour to get inside, which didn’t stop one man from touring the house six times. Why all the buzz? Because with building costs soaring out of sight, there is pent-up demand for a well-designed, green-built, contemporary home that’s actually affordable. That means it has to be efficiently constructed, and the best way to do this is in a factory, where it can be put together on an assembly line, like an automobile. The Glidehouse we displayed was built that way in 19 days in a factory near Vancouver, British Columbia, then trucked to our headquarters. 1. Module on the move. The two units rolled into Sunset’s parking lot after a 1,300-mile ride from the Britco factory in Agassiz, B.C., an hour east of Vancouver. The route had to be planned to avoid power lines and overhangs. But the 1,344-square-foot two-bedroom, two-bath house is no barebones Model T—it’s more like a Prius hybrid. It arrived nearly complete, down to the lightweight composite concrete countertops, slate tile backsplash, birch veneer built-in cabinetry, bathroom vanities, bamboo floor, and paint. 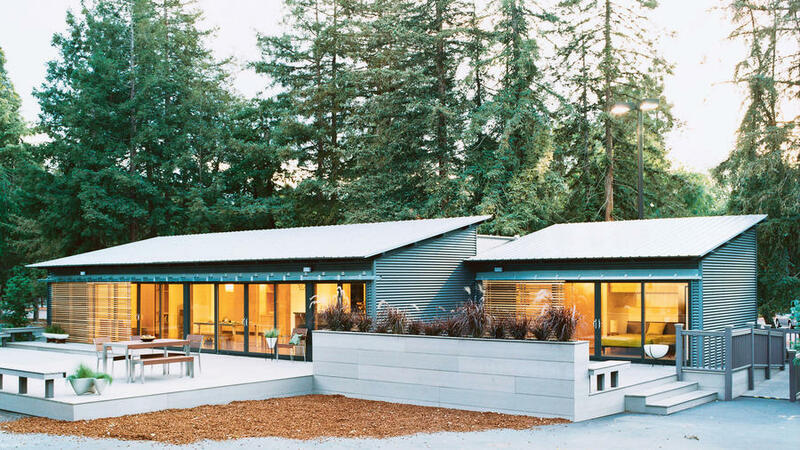 The design, one of several versions by San Francisco Bay Area architect Michelle Kaufmann, is simple and ingenious: Think Japanesque contemporary ranch house or modern California bungalow; don’t think mobile home. The Glidehouse is high-ceilinged and substantial, and affixes to a permanent, built-on-site foundation. In our configuration, two shed-roofed 14- by 48-foot rectangular modules are offset to create space for decks at each end. The kitchen and living/dining area occupy one module, which stays bright and airy thanks to a wall of sliding glass doors. The master suite, guest room, and guest bath are located in the other module. Big, rectangular wood screens on barn-door tracks slide across the windows of both modules to create shade and privacy without completely blocking natural light. 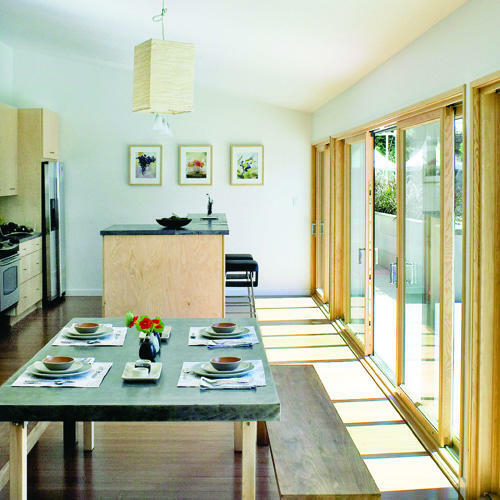 Kaufmann developed the initial plan after she and her husband, contractor Kevin Cullen, found they couldn’t afford to buy a house in the Bay Area. They decided to design and build one instead. “I was working on parallel tracks,” Kaufmann says. 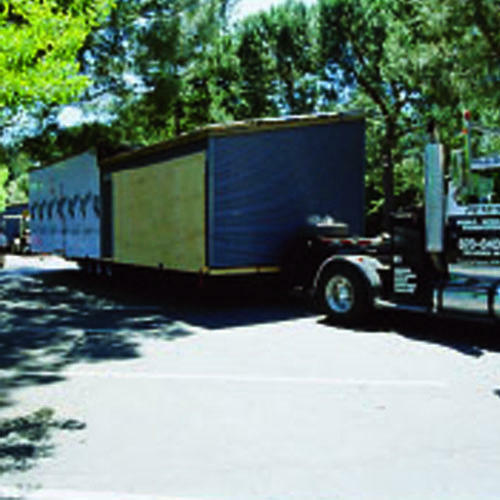 “For our site, the most affordable approach was to use structural insulated panels (SIPs). Kaufmann eventually partnered with a modular design/build company, Construction Resource Group of Redmond, Washington, to develop the Glidehouse. The Glidehouse is built to the Uniform Building Code, which covers new construction within the United States. Controlled factory conditions ensure minimal waste of materials and time while reducing the opportunities for weather-induced mold to develop. The house costs $120 to $160 per square foot, depending on the materials and fixtures selected. While building costs vary by region, quality construction typically starts at around $250 per square foot and rises exponentially. Kaufmann made it her goal to use environmentally friendly materials and worked with CRG’s environmental consultant—the Eagle Institute—to make the construction process as green as possible. They set the criteria for energy conservation and interior air quality. “Meeting these criteria is the only way we are able to build the Glidehouse in many areas because of the house’s extensive glazing; plus we feel it is the responsible way to build,” says Timi Starkweather, managing partner at CRG. The environmentally friendly materials and products that were selected for this Glidehouse design include bamboo flooring, concrete counters made of fly ash and recycled paper, soft foam insulation that fills all wall cavities, slate tiles, an energy-conserving heating system, an on-demand tankless water heater, and low-VOC (volatile organic compounds) paint. All wood-to-wood joints were caulked to make the house airtight. The factory-built modern home is an idea whose time has come again. The concept of prefabrication showed early promise with the Case Study Houses Program in Los Angeles during the 1950s, but progress stalled. Another take on the idea, Eichler tract houses, brought contemporary architecture to a mass market between the late 1940s and the early 1970s, but they were assembled on-site. As Sunset wrote in 1978, “The factory-built house has been a dream about to come true every year since the end of World War II.” Now it’s the Glidehouse’s turn. We’re betting this blockbuster will have a long run.